This MIDI controller is only two octaves. If you're looking for notes galore, that's not ideal, but if you're looking for a compact, portable keyboard controller with plenty of functionality, the SPC25 is worth a look. Plenty of control options, easy assignment to parameters of your choice, transport controls for driving a session driving. Keyboard action is a little springy, octave up/down not as straightforward as it could be, not as robust as comparable products. When M-Audio released its Oxygen8 controller keyboard, it started a craze for modestly-sized, controller-stacked MIDI keyboards that can simultaneously input notes and control in-DAW parameter settings. That craze is still going now. The latest product to enter what is now a busy market place is the USB-powered SubZero SPC25 MIDI Controller. 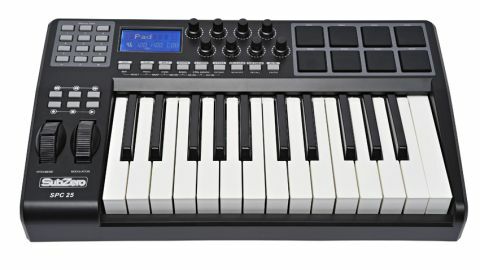 The '25' in the title refers to the controller's number of full-size, velocity-sensitive keys, which provide a two-octave range of notes and also have aftertouch functionality. Note entry isn't restricted to the keyboard alone, however. Eight drum pads are included if you prefer to bash out drum and percussion patterns via pads. These are assigned to particular note numbers by default, but you can change these to suit your needs. Alongside the pads, eight rotary dials lie to the left. These are staggered, making it easier to control one dial without inadvertently knocking the dial above or below. They are designed to work with MIDI control numbers and, again, can be assigned to those of your choice, enabling you to pair functions to your favourite software parameters easily. Elsewhere, you'll find full transport controls to help you drive your project directly from the controller rather than from your computer keyboard. A series of function buttons means you can edit, assign, enable or recall settings for the assorted control options. The back-lit screen will keep you in touch with these, but do be warned that this isn't as easy to read from all angles as it could be. We'd like to have seen a simple octave up/down selector to make jumping up and down through pitch ranges easy. This function is available, but is not immediately accessible; surprising, as there is room for dedicated buttons below the pitch bend and modulation wheels. Round the back, you'll find the all-important USB connector, which provides both data connectivity to your computer and the unit's power. There's also a separate 9V power supply, if you prefer, and this might come in handy if you're intending to use the SPC25 with older MIDI gear. With this in mind, five-pin MIDI-in and -out ports are provided. The rear panel is completed by two pedal ports. The keyboard action is a touch springy for our taste, while the drum pads, on the review unit at least, weren't uniformly 'flat'. Otherwise, this is a dependable keyboard controller. While two octaves might prove restrictive for some users, others will enjoy the increased portability the SPC's modest size provides. It manages to cram an impressive number of control options into its frame, and while this isn't the most robust keyboard controller we've seen, it's worth your consideration if you're shopping for a controller of this size.